Tools and settings to help you make menus faster. Since iMenuPro runs in your web browser you can utilize your web browser's spell-checker as you enter text (most web browsers flag misspelled words as you type them). Browser dictionaries, however, do not contain common culinary terms, adopted ethic words (your browser will likely flag Panini as misspelled) or brand names. And if you switch browsers or move from computer to computer, it's difficult or impossible to maintain a consistent personal word list. With iMenuPro's Spell Check you'll be able to use your own personal dictionary on any browser and from any device, and you'll get the benefit of thousands of culinary brands, words, and terms (including Panini) that are built into its spell checking dictionaries. To run a spelling check on your menu, use Tools > Spell Check. If any words exist on your menu that are not found in the iMenuPro dictionaries the Spell Check box will appear with the first potentially misspelled word highlighted. This field displays the potentially misspelled word, and below that, the context in which it appears on your menu with a list of suggestions. If you're sure the word is spelled correctly, click Add to dictionary. To use one of the suggestions, select it from the suggestion list and click Change. If you want to ignore the spell-checker suggestions for a given word, click Ignore to move on to the next word. Tip! If the suggestion you want does not appear, and you'd rather not add the word to your personal dictionary, you can edit the word directly in the text box and then click Change. Ignores the misspelled word (all ignores every occurrence of the word within the current element being checked). Changes the misspelled word to the highlighted selection under Suggestions (all changes all occurrences of the word within the current element being checked). If you Change a word you can Undo the change if the spell-checker is still within the current element being checked. Adds the highlighted word to your personal dictionary. Displays your personal dictionary where you can Add, Remove, or Search your dictionary for specific words. Allows you to set your native language (languages other than English variants do not include common English culinary terms). Immediately ends the spelling session. Note that if you click Done your entire menu may not be spell checked. Make it FIT takes your current menu and automatically adjusts page spacing and font sizes to make it fit onto a single page. It uses an algorithmical secret-sauce method to not only make your menu fit, but retain your overall design aesthetic as well. It's extremely useful for any single page menu such as daily specials. To use it, select the Tools > Make it FIT command or click on the toolbar. Tip! Once the FIT process is done, you can use Edit > Undo FIT to return your menu to its original state. You can also use the page spacing and font buttons on the toolbar, at any time, to shrink or expand page spacing or fonts sizes yourself. Page Spacing changes the amount of space between menu items (food items and headings) on a particular page. You can quickly adjust this spacing by clicking or on the toolbar. This lets you add more or less spacing in a uniform manner to your menu content so it retains its design aesthetics and fits onto a particular page. The toolbar buttons also let you see the changes in real-time on your menu page after each click. The amount of spacing applied to a particular page appears at the top status bar next to Spacing:. A value of 0.0 means no page spacing is being applied to the current page. A negative number means the page spacing is being shrunk. A positive number means the page spacing is being expanded. Page Spacing changes made with the toolbar buttons are applied in increments of your choice using Tools > iMenuPro App Settings. There you set the amount applied per each click of of the toolbar buttons. To set an exact Page Spacing value on the current page you are viewing, use the Tool > Page Spacing command. The allowed range is from -0.20 to 2.0. The toolbar buttons usually provide better feedback however, since page spacing can vary from style to style. Click on the toolbar or use the Tools > Page Spacing command. Click on the toolbar or use the Tools > Page Spacing command. Note: Switching Menu Styles also resets the page spacing. Click Expand Page Spacing on the toolbar to remove white space at the bottom of the page. Tip! There are other methods to change the spacing on your menu such as Custom Spacing (for any Food Item and Heading) or Line Spacing which add spacing within the actual food item or heading, but Page Spacing should be your first choice as it uniformly spaces the food items and headings without having to change individual item spacing. Clear All provides a method of removing certain elements from your menu without having to start a new menu. This can be useful if you are editing a copy of a menu that contains more elements than you need on the copy. Or if you just want to start over and clear away certain elements such as all food items, images, floating text, etc. To clear stuff, simply use Tools > Clear All and check the boxes for the elements you want cleared, and then click OK. NOTE Heading accents do not get removed but instead get reset to (style) meaning they adopt whatever accent your current menu style is using..
Auto Bin/Number lets you automatically add Bin/Numbers to all food items that are on your menu. Choose the options you want and then click OK and iMenuPro will add the Bin/Numbers. Enter the number here that you want the auto-numbering to start at. If you want to have a prefix of letters, numbers, or symbols that precedes the number, enter that here. For example to have the numbers be C1, C2, C3, etc. enter C for the prefix. The prefix can be up to 3 characters. Check this box if you want a period after the number, such as 13., 14., etc. Check this box if you want any Bin/Numbers that are currently on the menu to remain unchanged. This lets you replace just the Bin/Number entries that are blank. If this box is not checked, all food items on the menu will have their Bin/numbers replaced. Tip! Once Auto Bin/Number is done, you can use Edit > Undo to return your menu to its original state. Smart Mark uses a built-in word list to replace words that should normally be written with accent marks (diacritics). For example it can replace Entree with Entrée. You can add your own word-pair replacements or remove unwanted ones, or you can disable Smart Mark entirely under Tools > iMenuPro App Settings. If Smart Mark is turned on, iMenuPro searches for and replaces words in the word list after each food item, heading, footer, or floating text is edited. This field should contain the word that you want replaced. The Replace and With words will be added to the Word List when you click the Add button. Unless the word is always capitalized, enter it in lower case. This field should contain the word that is replaced by the word currently listed in the Replace field. The Replace and With words will be added to the Word List when you click the Add button. Unless the word is always capitalized, enter it in lower case. Removes the highlighted word pair selection from the Word List. 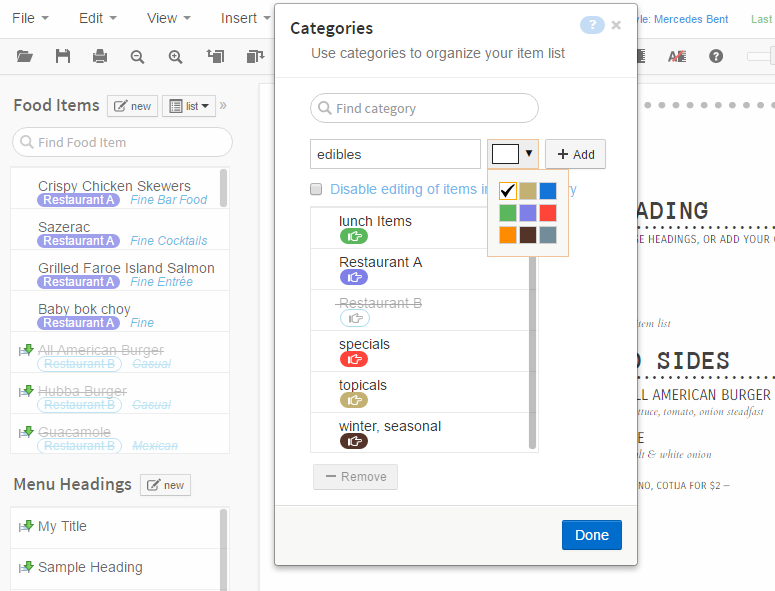 The Category Labeler allows you to label your foods with color-coded category tags to better organize your food list. Categorizing is especially handy for large food lists or multi-establishment setups. Categories do not appear on or affect menus – they are a list management tool. You can add dozens of categories and can edit them at any time. 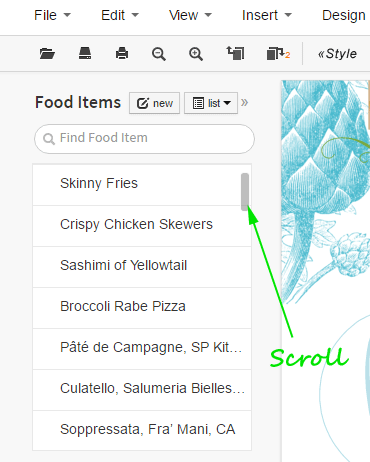 Once edited, the changes will automatically apply to any items that are labeled in your food list. Enter the text for the new category you want to add in this field. Then click the Add button to add it to your list of categories. Click a category in your list to select (highlight) it and edit it. Once selected, you can change the text, color, or disable option for the category. When done editing, click the little OK button next to the text. To discard your edit, click the little X button. Lets you pick the color for any new or edited category label. Choosing white means the label will have no color fill. Checking this box will prevent food items tagged with this category from being edited. The items will appear muted in the food list (grayed out) to indicate disabled. Removing the check will re-enable editing for items tagged by this label. This allows you to effectively block certain groups of foods, at once, from being changed (edited). It also alerts you to groups of foods you might want to avoid using for certain menus. NOTE You can still use disabled foods on your menus - you just can't edit them. And if an item tagged with a disabled category is already on a menu, it will remain there unless you remove it. The Remove button removes a selected (highlighted) category from the category list and also removes it from any food item tagged with this category label. Be careful with Remove as this action is irreversible. iMenuPro lets you sync your printed menus with your website and social media platforms like Facebook and Twitter in a mobile friendly format. Mobile friendly means your web menus will be automatically reformatted and resized to look great on all devices - from small mobile smart phones to large desktop computers. And they'll load super fast since they're created in native browser code. Best of all, you can automatically sync them to your printed menus so every time you change (save) your printed menus the changes will appear immediately on your website, Twitter, and Facebook page, like magic — automatic web menu updates with no downloading required. It works by inserting a small snippet of code (the Embed code) into your website that's generated by iMenuPro. Once inserted, your printed menu will be linked to your web menu, as long as the code is on your website. For any menu you want synced to your website, use Tools > Live-Sync Menu and click the Sync Now button. The first time you click Sync Now iMenuPro will generate a small snippet of HTML called the Embed code. Simply copy this code to your website where you want your menu to appear (you only need to do this one time). Once the code is on your site, each time you click Sync Now the menu content of your printed menu will be synced to the web, and your menu changes will appear immediately on your website. At any time (even before syncing) you can preview what your web menu will look like on a mobile device or desktop browser by clicking the preview options Mobile or Desktop at the top of the window. This setting controls how your menu will look on mobile devices or larger desktop computers. Live-sync menus use different technology than their printed counterparts in order to display faster and read better on small devices. If you want to retain the vibe of your printed menu, choose Match which will match the fonts and colors of your printed menus but scale and format them for the web and mobile devices. If you want even faster loading or better small-device readability, try one of the other Appearance options which were designed for fast loading, optimal readability, and harmonious presentation on most websites and devices. Lets you choose the background color for your web menu. If you have selected Match for Appearance and are using a paper color for your printed menu background, the initial color here will match your current menu's paper color. Lets you override the preset text colors from Appearance with a different color. 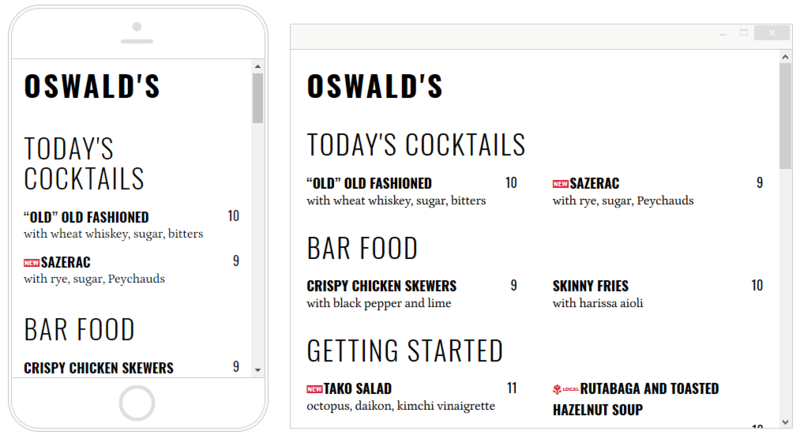 Clicking more... lets you make additional customizations to your mobile-friendly menu. You can also change the File Type for your print-alike menu if you have that feature enabled. And you can export the raw HTML used to create your live-sync menu if you need to archive it. If this setting is checked, iMenuPro will automatically sync your web menu to your printed menu whenever you save your menu (this excludes automatic menu saves by the app such as Auto-save, automatic save at logout, etc.). If you'd prefer to sync your website menu only at specific times (useful if you're making lots of edits to your printed menu that you don't want reflected on your web menu) then leave this setting unchecked. If this setting is checked, in addition to your mobile-friendly Embed code, iMenuPro will create another unique embed code for a replica of your printed menu. 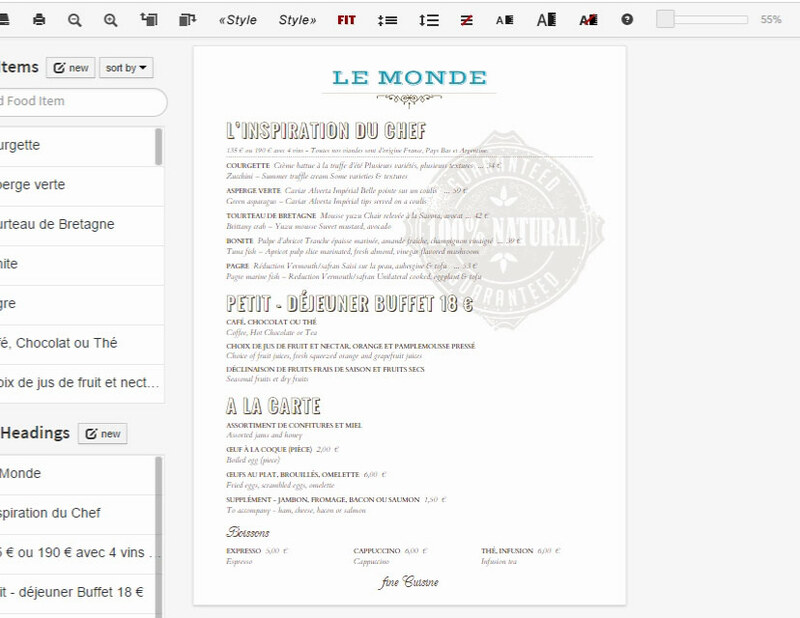 The print-alike Embed code will display an image copy of your menu on your website instead of a native browser version. The advantage of print-alike is that your website menu will be an exact clone of your printed menu – retaining all the formatting and design elements in their Technicolor glory. The disadvantage is that it will take a bit longer to load and may be hard to read on small devices such as mobile phones or mini-tablets. But, if you want an exact clone of your menu on your site or social media, this is the way to go. Additionally, if you have a separate section or 2nd site for mobile customers, there's nothing preventing you from using both embed codes at once, in different places or on different sites. This button syncs your website menu to your current printed menu, i.e, your web menu is updated with the current contents of your printed menu (even if you haven't saved your menu yet). If you're syncing a menu for the first time, this button also generates the unique Embed code that allows the menu to appear on your website or social media pages. If you have Automatic Sync enabled, you won't need to click this button after the first time. Otherwise, whenever you're ready to sync new changes to your web menu, just click this button and the changes will appear on your website, Facebook page, or Twitter tweets. Replaces the currently synced menu content on your website with a menu that says 'Not published yet'. This is useful if your daily menu 'expires' and you don't want stale content on your site. Simply unpublish the menu, and then re-sync when your new content is ready. Note: Unpublish does not change your embed code, so you don't have to change your website to unpublish a menu. The Embed code is a small snippet of HTML (unique to your menu) that you copy and insert into your web page (or MenuPro Menu App Facebook page) where you want your menu to appear. If you have a person who designed or makes changes to your website, commonly referred to as a Webmaster, you can email them the embed instructions by entering their email address and clicking Send. If you also have Print-Alike enabled, a new tab will appear that contains the Embed code for the print-alike version of your menu. Tip! Copying the Embed code to your web page (or Facebook page) only needs to be done once. If the code is already on your website, your menu changes will appear immediately on the web whenever you Sync your menu. OneEmbed lets you rotate any menu on your "daily specials" website page without changing embed codes. Normally embed codes work by being unique to specific content – for YouTube that content is a video. For Spotify that content is a playlist. For iMenuPro that content is a menu. But with OneEmbed you can share the same embed code with any menu. This lets you swap in different specials or seasonal menus at a single spot website location, without having to edit the page. If checked, your next sync (or unpublish) will use a special embed code rather than the menu's normal code. After syncing the code is displayed in red to designate that you last synced this menu with OneEmbed. Just like a normal embed, you can copy the special Embed code and add it to your website. Then, any menu that syncs with OneEmbed will appear on your site. OneEmbed works with both Mobile-Friendly and Print-Alike live-sync menus (there's a special code for each type). To return to normal embed syncing for a menu, simply uncheck OneEmbed and then re-sync. After you sync your menu, you can tweet it as well. Just click the Tweet button and follow the Twitter prompts. If you update your menu, remember to sync first before tweeting so your followers get the latest version of your menu. To get your live-sync menu on Facebook CLICK HERE to install the MenuPro Menu App on your Facebook business page. Then follow the instructions in the app to add your Embed code. Once added, changes made to your printed menu will be synced to your Facebook page menu as well. What about Google My Business? Google My Business is a great way keep your business information accurate on the web - including your menus. If you don't already have an account you should sign up HERE today. It's free and adding your menu link to your business page is free as well. 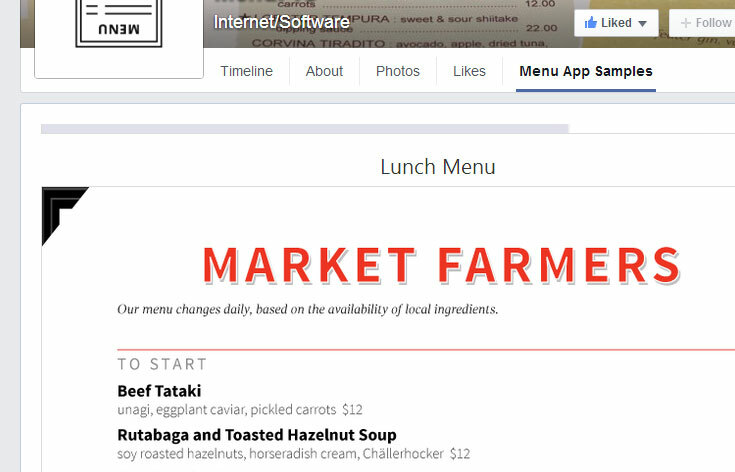 If you run a restaurant, or business with a menu of services, previously Google added a Menu link pulled from partnering companies that scrape the web looking for website menus. This practice quickly led to frustration among business owners because the scraped menus were almost always out-of-date with stale items. And the only way for the owners to change them was to pay the partnering companies (monthly) to update their very own menus. This is sort of like someone throwing a brick through your storefront window and then charging you to fix it. After receiving many complaints, Google took notice and now lets you change the Google Menu link (Menu URL) to the actual menu on your website instead of the scraped menu. 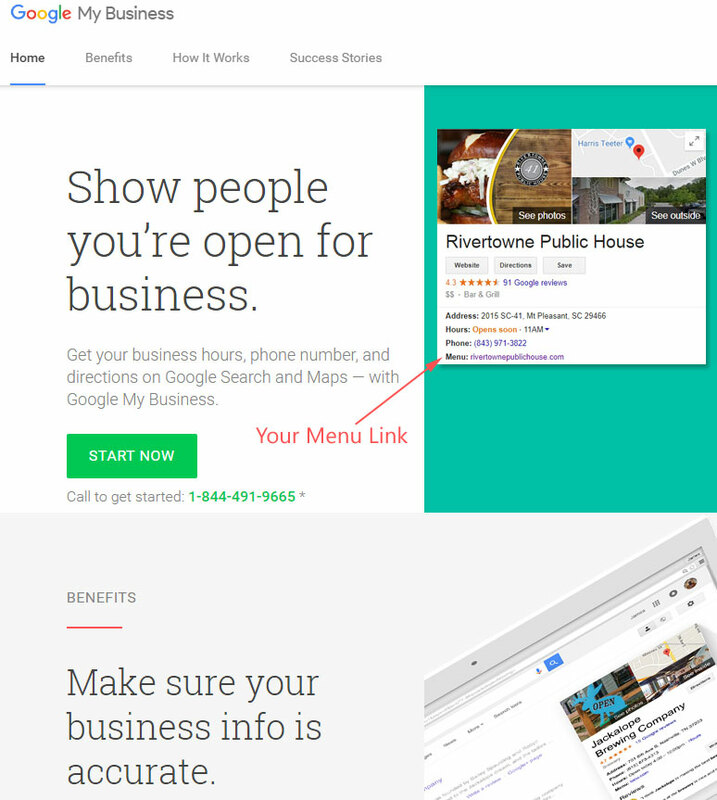 UPDATE April 12, 2017: The Google My Business Dashboard now allows restaurants and service businesses to add their own Menu URL. Previously, this feature was available but hidden - you had to contact Google directly, by calling their main number or using this form, and request the change. 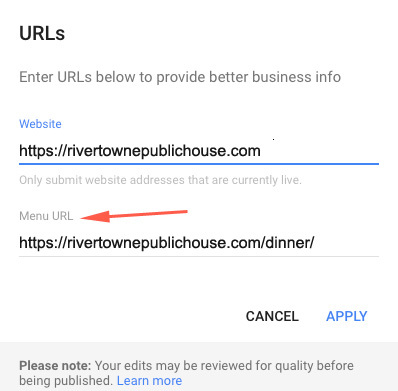 The Menu URL feature is now available to regular dashboard users via the Google My Business URL Attributes section, for restaurants and other businesses that use menus. Once your Google Menu URL is added, any updates to your website menu - via iMenuPro live-sync - will be immediately available to your customers who found you through Google. Yelp also lets you add a menu link to your Yelp business page. Find the Edit Business Info link on your business page and click it. Find the Menu Web Address field and enter your menu URL from your website - it will be something like https://www.myrestaurant.com/menu.html This would be the website page where you've added the live-sync embed code, but not the embed code itself - just the website page URL. That's it! Now any updates to your website menu - via iMenuPro live-sync - will be immediately available to your customers on Yelp. NOTE These instructions may change if Google or Yelp changes its page layout, but your menu link will always be the same. To publish a visually identical copy of your printed menu on your Facebook page, or for use on a Digital Menu Board, use Tools > JPG Menu which lets you create a JPG menu image that can be saved to your computer and then uploaded to your Facebook page (or any other social media site) or to an HDTV monitor for use as a digital menu board. Use this format for Facebook, your website (if you want JPG rather than live-sync) or any other social media site. The resolution will be very good and the file size is smaller than the HD format, so it will download faster on the web. The quality of this format is even suitable for smaller digital menu boards. Use this for format for large HDTV monitors that are in use as digital menu boards. The file size is larger, but the resolution is almost double that of the Normal format. After choosing a format click the Create button to convert your menu into the JPG format. Once the process is complete, your JPG menu image appears in your browser window. Click the save page button to save it to your computer (each page will be a separate image and there's a save button for each page). Once saved, you can then upload the image to Facebook or other sites, or copy it to a thumb drive for display on an HDTV. Tip! For more control on how your menus are presented on Facebook, use the free MenuPro Menu App for Facebook. The Facebook Menu App installs a stylish Menu Tab in a high-profile position on your Facebook page so customers can easily view your menus without having to hunt through the timeline. CLICK HERE to install the MenuPro Menu App on your Facebook business page. The table tent creator creates a 4-UP, 2-UP, or 3-UP PDF table tent from your current menu page. 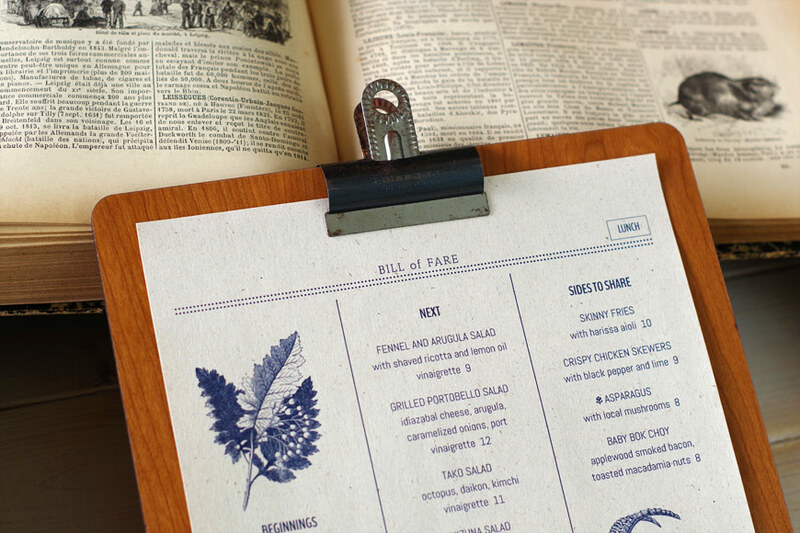 You can use any menu, any size paper, and any page orientation. To create a table tent use the Tools > Table Tent command. For the Table Tent format choose either 4-UP or 2-UP and then click the Print button. Once your table tent is printed, simply cut down the middle and fold. Tip! Using card stock or heavier paper works better. 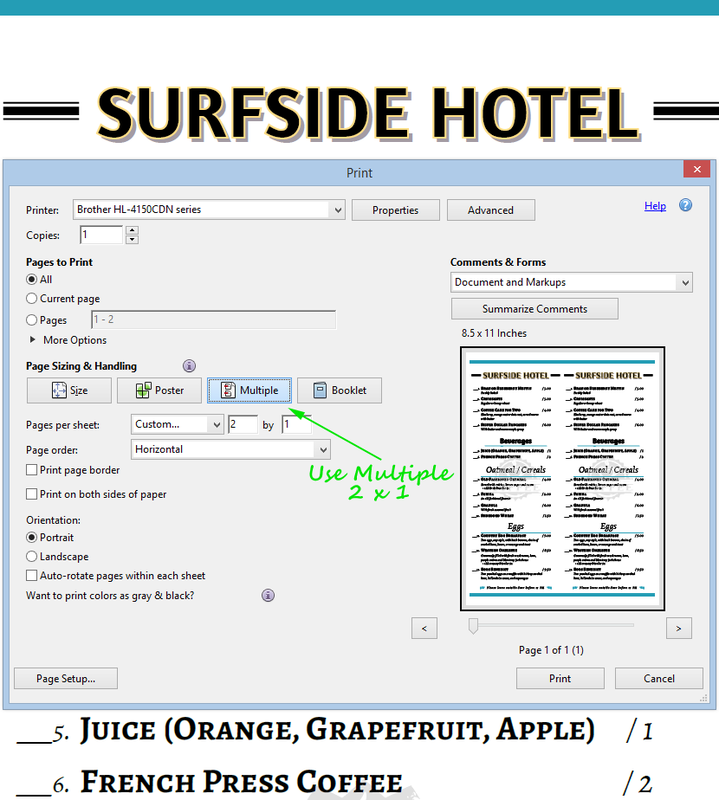 NOTE For 2-UP or 3-UP table tents, to fit identical menus onto a page the PDF page must be enlarged. For example, for two long thin 4.25" x 14" menus on one sheet of 8.5" x 14" paper, use File > Page Setup with a custom paper size of 4.25" x 14". Then use 2-UP to create the single 8.5" x 14" PDF page with 2 menus, side by side. For another example, to fit 2 portrait type table tents onto 8.5" x 11" paper the finale PDF page must be rotated. So use File > Page Setup with a custom paper size of 5.5" x 8.5". iMenuPro will then create 2 menus onto an 11" x 8.5" PDF page. For a 3rd example, to fit 3 landscape type menus onto legal 8.5" x 14" paper use File > Page Setup with a custom paper size of 8.5" x 4.666". iMenuPro will then create 3 menus onto an 8.5" x 14" PDF page when using the 3-UP option. The gift certificate creator lets you create gift certificates and coupons to boost sales, reward loyal customers, and increase foot traffic at your business. You can create single certificates per page or 3 certificates to a page on either US Letter (8.5" x 11") or A4 paper sizes. To create a gift certificate use the Tools > Gift Certificate command. Then add or change the title of the certificate, business name and address, and fine print conditions. You can also edit the certificate type such as amount $ for a certificate that lets you fill in the amount as needed for individual customer redemptions, or coupon text such as Free Drink, 15% OFF Dinner or Buy 1 Get 1 FREE. Once your text is entered, choose a Style, change the Background (if you want a different one), add your Logo (optional), and then click the Print button to create the PDF certificate which can then be printed and cut. NOTE If you need more than one type of certificate, make sure to print a PDF first and save it to your computer - the certificate maker saves only the current selections. Tip! The certificate's middle 3 lines are uneditable and translated based on your Dictionary Language setting for Tools > Spell Check. iMenuPro offers a Tools > Import Food Items command that allows you to import food items from MenuPro (desktop versions 6 through 10), from iMenuPro itself, or any other system where you can create a text CSV file of your data. This allows MenuPro desktop users to quickly add their food items to iMenuPro in bulk, and allows iMenuPro users to transfer large food lists to another iMenuPro account. This is not a sync command between iMenuPro and MenuPro, or any other system, but it does give you a way to migrate large amounts of food items into iMenuPro without having to add them manually. If you have exported from MenuPro or iMenuPro, you don't need to worry about the format, since your export file will be correctly formatted. The formats must be exactly as shown, each field within double quotation marks and the fields separated by commas. If you have a double quote within the field, use two double quotes together like this: "served with ""Angus"" beef". If you have more than one price for a single item, separate the prices with a semicolon like this: "12.95;14.95;16.85". And if using the full format, the reserved fields that are not used (the extra commas) must be included. The full format requires 12 fields on each line, and in the correct order. Again, if you are importing a file from MenuPro or iMenuPro you don't need to worry about this format. If not, click here to download an import template file. The only option for this command is the file itself. 2 Save the file mpdata_.txt to your PC desktop so you can easily find it. 3 In iMenuPro, use the Tools > Import Food Items command. DO NOT IMPORT ANY OTHER TYPE OF MENUPRO FILE. IT MUST BE A MENUPRO .TXT FILE ONLY. 5 If your file is valid, your food items from MenuPro desktop will now appear in the Data Preview. Before clicking OK to finalize your import, look carefully at the Data Preview to make sure your food items look correct. If they don't or the Data Preview is blank, click Cancel and try again by going back to step 1 to generate the correct export file. If the food items under Data Preview look correct, then click OK to import them into the iMenuPro food list. Important! After successfully importing a file, do not repeat as you will end up with duplicate food items - this command does not check for duplicates. Only use this command one time (unless you are importing single items), during your initial setup phase to migrate your food items from desktop MenuPro into iMenuPro. After your import is complete, it may appear you have not imported anything if your list is sorted by Date added. But just use the scroll bar on the list to view your items. 2 Pick a list type from the available options, then click the Export button and Save the file impdata.txt to your computer desktop so you can easily find it. 3 In the other iMenuPro account, use the Tools > Import Food Items command. DO NOT IMPORT ANY OTHER TYPE OF IMENUPRO FILE. IT MUST BE AN IMENUPRO .TXT FILE ONLY. 5 If your file is valid, your food items from your original iMenuPro account will now appear in the Data Preview. Before clicking OK to finalize your import, look carefully at the Data Preview to make sure your food items look correct. If they don't or the Data Preview is blank, click Cancel and try again by going back to step 1 to generate the correct export file. If the food items under Data Preview look correct, then click OK to import them into your new iMenuPro account. Important! After successfully importing a file, do not repeat this command as you will end up with duplicate food items - this command does not check for duplicates. Only use this command one time (unless you are importing single items), during the initial setup phase of your new account to migrate food items from one account to another. Additionally, if you are importing categories, those categories must exist on the new account before importing. WARNING IF YOU EDIT, BE CAREFUL! Once you export your file, although it's a text file and easily editable, do not attempt such unless you fully understand the CSV format. One misplaced comma or quote mark or file encoding change can cause all of your data to be imported incorrectly. And there is no mass delete command in iMenuPro. To create a PDF file of all of your food items, formatted as a list, use Tools > Export your Food Items and then select the list format from the available options, and then click the Print PDF button. To export your food items as a CSV (comma-separated values) text file, use Tools > Export your Food Items, pick a list type from the available options and then click the Export TXT button. You can also export a single food item to a CSV text file by right clicking the food item in the food list and selecting Export Food Item. If this box is checked, for any food item file exported from iMenuPro, row 1 will consist of the names of the exported fields. This is needed if you'll be importing your data into SQUARE or other POS systems. Settings let you set preferences to control how iMenuPro operates. All (except Convert Bold Bite tags) do not change your menus directly, but can change the way certain commands work such as Print to PDF settings, Find settings, etc. This setting controls how much page spacing is applied to your current menu page when you click the Page Spacing buttons on the toolbar or use the Tools > Page Spacing commands. This setting controls what units are displayed and used for numeric input boxes. This setting is the amount of time that iMenuPro waits before automatically saving your current menu in the background. You can set this from 1 to 999 minutes, or set it to 0 to turn off the Auto-save feature. Check this box to use Smart Mark when entering text for food items, headings, footer, or floating text. Check these boxes to have the food item Description and Extras included, and also the Notes included, when using the Find Food Item search box. Unchecking them will remove these elements from the search so only the Food Item name is searched. Entering a value here, other than 100%, will scale your PDF and JPG menu sizes based on the value entered. 50% will produce PDF menus twice as small as your iMenuPro page size. 200% will produce PDF menus that are twice as big. The same applies to any JPG menus you create. The value here does not change the page size of your menu in iMenuPro – it only effects the resultant PDF or JPG file that is produced from that menu. Menu Scale can be useful if you're creating a menu board that is quite large, but you want to work and edit in iMenuPro with a more reasonable page size. Simply choose a normal or custom page size using File > Page Setup and then scale it up here. For example, if you have an 8.5" x 11" menu, and your Menu Scale is set at 200%, the resultant PDF menu will be 17" x 22". NOTE Menu Scale affects all PDF and JPG menus if it's set to anything other than 100%, so make sure to reset it back to 100% when done. If this box is checked iMenuPro will use the highest resolution images possible on your PDF or JPG menus. For PDF menus, this is useful if you are doing high-resolution printing and want to make sure your images are printed at the highest resolution. The rest of your menu elements such as text, accents, borders, and vector type images are unaffected by this setting and are always rendered at the highest quality possible. Using this setting will likely increase the size of your PDF file however, so if you are using PDF's for website display or you have a very large menu with many high-resolution images, you'll want to turn this option off to avoid an unnecessarily large PDF file. Crop marks (sometimes called trim marks) are short lines at the corners of a page that show where the outer edges of the paper should be trimmed. Bleeds are extra background color that extend 1/8" beyond the actual page size of your menu, and are used by commercial printers to avoid strips of white paper showing at the edges of your printed menus should the print batch be misaligned when trimmed (cut to size). In iMenuPro, bleeds only appear if you are using a background paper color. If you're printing in-house, you won't require Crop Marks or Bleeds so leave this box unchecked. If you're sending your PDF menu to an outside commercial printer, check with them first as many won't require crop marks or bleeds either since iMenuPro PDF menus are already scaled perfectly to size. Check this box to create your PDF menus and gift certificates using the U.S. Web Coated (SWOP) v2 CMYK color profile. Some commercial printers prefer this profile to ensure consistency across the printing process. Since iMenuPro uses RGB by default, when using CMYK for PDF your colors may change slightly on the PDF - this is normal and part of the color conversion process. Check this box to create your PDF menus and gift certificates with PDF/Universal Accessibility. Use this option if PDF files published on your website are subject to GSA Government-wide Section 508 technical provisions. Check this box to create duplicate pages when creating your PDF menus. For example, if you have a 2 page menu and this setting is checked, when you create your PDF menu, it will contain page 1, page 1, page 2, page 2. Example using Acrobat and Dupe to get 2 identical menus per page (see also our Table Tent add-on for an easier method). If this box is checked iMenuPro will check for and convert any Bold Bite tags (text formatting codes) that you've entered when drawing your current menu. Affectionately named after our favorite restaurant in Bethesda, MD., Bold Bite tags will not change your overall layout or design – they will just change the color or decoration of certain words or phrases you've tagged making them stand out in bold, underline, or a different color. If this box is unchecked iMenuPro will not convert the tags when re-drawing your menu. What's a Bold Bite tag? Bold Bite tags are special characters that tag (surround) a word or phrase allowing you to make that word or phrase stand out in bold or other decoration. 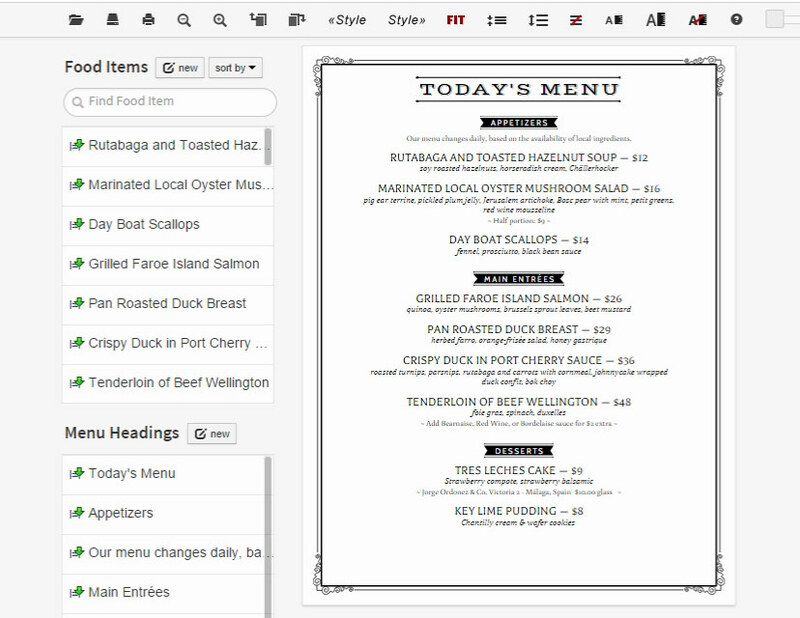 You can use them on Headings, Floating Text, Food items (excluding the price field) and the menu Footer. <c>word</c> change the color of the word or phrase to match the item's accent color (not available on Headings). For the Bold Bite tags to work, they must not contain spaces within the tag itself. And if you're using live-sync menus, the tags (excluding color change) will automatically transfer to those as well. NOTE Bold Bites will not work on Internet Explorer 11 as it does not follow the published W3C DOM parsing specs for these tags. All other browsers currently support them. Check this box if you want your Live-Sync menus to have the date and time that they were synced at the bottom. This is useful if you're syncing daily specials to your website and want your customers to know when the menu was published. If this box is checked, and you have made design changes such as adding a new border, changing a font, or changing a background, those changes will remain when you switch Menu Styles. This is useful if you're not sure what layout or fonts you want but you're sure you want a certain background, border, accents, etc. Or ... you might know what specific font you want but are not sure about the background, border, design, etc. In this example, you would use the Fonts menu to select the fonts, colors, and sizes you want. And then, if this box is checked, each time you switch Menu Styles those fonts will not change. Tip! Your settings are saved with your account when you log out, so when you log back in they will be the same as when you left them. Tip! If you've modified the current Style design defaults, this icon appears in the menu bar to remind you that something in the current Style has been changed. View commands control what you see on the screen but do not affect your printed menu content. Depending on your computing device, you can use the views to resize the size of the menu preview, view your menu in a menu cover, or overlay a grid on it - all to assist you in getting a better feel for the menu you're creating. The View > Menu Cover command lets you preview your menu in a variety of simulated menu covers of any color. If you slide your menus into covers, as many restaurateurs do, it's often useful to ensure that your final menu design is in harmony with your covers. After selecting a cover style and color, check Show on Menu to view the cover on your menu. Tip! If you want the cover to appear on your final printed menu (sometimes useful for Web or Facebook menus) uncheck the Preview only option. The View > Grid command lets you overlay grid lines on your menu to facilitate accurate positions of items. You can change the color of the grid and the grid units (the size of the grid boxes). After selecting the units and color, check the On Menu box to view the grid lines. The zoom commands (listed as percentages under the View menu) let you shrink or enlarge the menu on the screen. For finer adjustment to the zoom level you can click or on the toolbar or use the zoom slider (to the right of the toolbar buttons). This temporarily disables the menu text drag functionality in order to allow unrestricted access to moving, selecting, and positioning images that might otherwise fall partially under or between the menu text. Once you're done, just re-enable as it's an on/off toggle. This temporarily locks images in place in order to allow unrestricted access to moving, selecting, and positioning menu text or floating text that might otherwise be in the way. This is especially useful if you are using an inserted image as your own menu background. Once you're done, just unlock them as it's an on/off toggle. Tip! Click Zoom Percentage to enable/disable menu text allowing easy image moving and resizing. Night mode toggles the app into darker hues to make it easier to create menus in environments with less light.